Are donations to WAGS tax deductible? Yes. WAGS, Inc. is a 501(c)(3) nonprofit corporation. Therefore your contributions are tax deductible to the full extent of the law. We will do our best to accommodate your request. For speaking events outside an approximately 25 mile radius of our office, we appreciate a donation to compensate for staff time and travel expenses. To discuss arranging for a speaker, please contact us at 608-250-WAGS (9247) or send us an email. What dog breeds does WAGS use? WAGS works exclusively with Golden Retrievers and Labrador Retrievers. How are WAGS dogs trained? WAGS dogs are raised, socialized, and trained by volunteer Puppy Raisers volunteers under the direct supervision and guidance of our Training Director. We use the positive reinforcement training approach to teach and shape the dogs skills and behaviors. What tasks are WAGS dogs trained to do? WAGS dogs are trained to help individuals who have limited physical mobility. 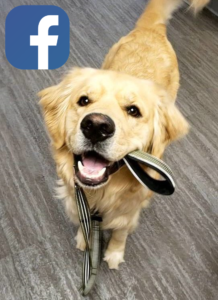 Some of the skills our dogs learn are: pushing accessible door buttons, tugging open a refrigerator door, flipping a light switch, or retrieving items and placing them in the individual’s hand or lap. Does WAGS train dogs to alert when an individual is having a seizure or a diabetic episode? No, WAGS does not train dogs to do seizure or diabetic episode alerts. Does WAGS train dogs for children with autism? No, WAGS does not train to assist children who have autism. What is the fee to obtain a Service Dog from WAGS? The cost for a WAGS service dog is $6,000. The cost for a WAGS Home Helpmate dog is $4,000. These fees help us cover the costs (approximately $12,000) incurred during the two years of raising and training a WAGS dog. This includes, but is not limited to, veterinary care, dog food and treats, training materials and supplies, ongoing client training and services, facility costs, training and administrative costs. 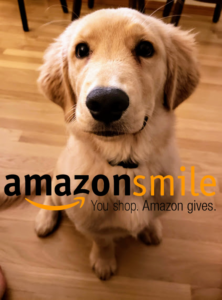 WAGS works with each client to help them raise the funds to pay for their service dog. We also will set up a payment plan that makes it possible for the client to cover the cost of the dog in a comfortable and manageable way. What is the difference between a WAGS service dog and a WAGS Home Helpmate? A WAGS service dog is partnered with an adult client who is the sole handler of the dog. The service dog has skills appropriate to attend work or other public venues with their client handler. A WAGS Home Helpmate Dog is partnered with children or individuals who need the skills of a service dog in their home, but don’t need access to public venues with their service dog, or are not able to assume responsibility for the dog in public on their own. 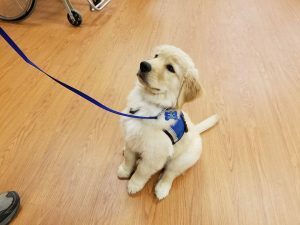 How long is the wait for a Service Dog from WAGS? It is difficult to give an exact waiting time since this is affected by so many variables (number of clients on the waiting list, number of dogs in training, and our emphasis on making sure we match the right dog to the individual.) On average the wait time is one to two years. This is consistent with the national average for service dog organizations. Who is eligible to apply for a WAGS dog? Be able to meet the emotional and physical/exercise needs of a dog. How long does each WAGS dog work? The average working life of a WAGS dog is eight years. Upon retirement, these dogs live out the rest of their lives as pets, often times with their partner, or with family or friends of the client. What happens to the dogs that do not graduate? WAGS is proud to have a very high rate of dogs that graduate as Service Dogs or Home Helpmate Dogs. From time to time we do have a dog that due to health or temperament is unable to be placed in one of the four WAGS dog roles. Those interested in adopting a non-graduate dog need to fill out a APPLICATION Non-Graduate, pass a home visit and pay the required adoption fee. A non-graduate is usually released between 1-2 years of age. They are spayed or neutered and are current on vaccinations. 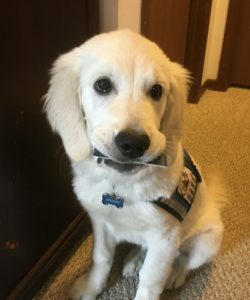 Will you train my dog to become a service dog? No, WAGS does not train personally-owned dogs. Are there laws that protect individuals with disabilities and their service dogs? Yes, in the United States, there are both federal and state laws that mandate access for Service Dogs. Section 36.302(c) of the The Americans with Disabilities Act (1990) requires public accommodations generally to modify policies, practices, and procedures to accommodate the use of service animals in places of public accommodation. The first Federal legislation to directly address public access rights of people with disabilities who have service animals was the Air Carrier Access Act of 1986. The act amended the Federal Aviation Act of 1958 to provide that prohibitions of discrimination against handicapped people apply to air carriers. Regulations clarify that air carriers must permit “dogs and other service animals used by handicapped people to accompany the people on a flight.” As a result of these 1986 stipulations regarding air transport, the 1990 Americans with Disabilities Act does not reference air carriers in its Title II and III transportation requirements.